WASHINGTON — President Donald Trump took to Twitter on Wednesday to revive his long-standing complaint about the FBI’s handling of the Hillary Clinton email server investigation, alleging that then-Director James Comey had protected the Democratic presidential nominee by prematurely “exonerating” her before the 2016 election. President Trump’s latest online burst came in response to the FBI’s release of heavily blacked out draft statements from May 2016 by Comey in preparation for closing the Clinton investigation without criminal charges. In interview excerpts released in August by the Senate Judiciary Committee, FBI officials said Comey and investigators had determined by the spring of 2016 that charges weren’t warranted, and had begun thinking of how the public should be informed of that decision. Clinton was interviewed by the FBI in early July, just days before Comey announced the investigation’s conclusion. That timing has prompted criticism that FBI leadership had prejudged the conclusion before completing the investigation. When Comey announced the end of the case last year, he said the FBI had found no evidence that anyone intended to violate laws governing classified materials, which it considered a prerequisite for bringing a case. He said the FBI had thoroughly investigated the case for a year before deciding to conclude it. “We went at this very hard to see if we could make a case,” Comey told the House Oversight and Government Reform Committee days after announcing his recommendation that Clinton not face charges. President Trump, as both a candidate and now president, has long complained about the FBI’s handling of the email case, though his criticism has varied. 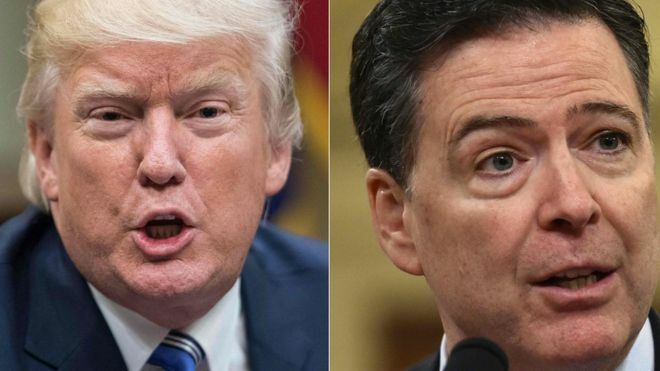 He initially cited Comey’s actions in the investigation as a basis for Comey’s firing in May, though Trumo later acknowledged that he was determined to replace the FBI director even without the recommendation of the Justice Department. The president complained again after Sen. Chuck Grassley, the Republican chairman of the Senate Judiciary Committee, released excerpts of interviews with FBI officials close to Comey. Those interviews showed that draft statements to close out the Clinton investigation had begun circulating among a tight circle of FBI officials in the spring of 2016. The interviews were conducted by officials from the Office of Special Counsel who were trying to determine if Comey’s actions had violated a federal law that bars government officials from using their positions to influence an election. That investigation was closed following Comey’s firing by President Trump in May.